Cyanotypes are one of the oldest photographic processes dating from 1842 discovered by Sir John Herschel (that man invented a HUGE amount of things among which: sodium thiosulphate fixer (hypo), the actinometer, various moons of Saturn and Uranus etc.). He saw the process as a way of reproducing notes and the like. This is where the name ‘blueprints’ comes from and is still being used today for building/construction plans. Anna Atkins is the women who used this process as a form of photography making photograms of ferns and other plant life. She is regarded to be the first female photographer. Ever. The light-sensitive chemistry in a cyanotype consist of equal parts potassium ferricyanide and ferric ammonium citrate solution. The cloth in this case, is then being immersed in this solution, squeezed and left to dry (in the dark of course ;-)). The cloth is then being exposed and ‘developed’ in water, rinsed, squeezed and dried. Not very insanely difficult like some other processes. The blue comes from the formation of ferric ferrocyanide, also known as Prussian Blue. I never liked the blue colour of the cyanotype process, I still don’t. For nature and portraits the colour just feels unnatural to me. But, one can give the image a different colour by ‘toning’ the print in tea or wine. To me it tends to get more appealing that way. 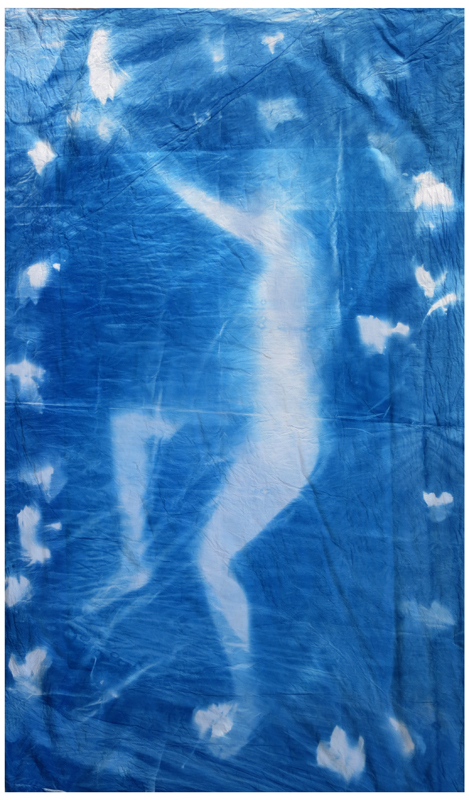 But when I arrived at the Picto meet last Sunday there were people laying on curtains outside in the sun, making a life size photogram cyanotype style. The results were awesome! The man who prepared these large cloths, Claude Bouchez, had a couple left and asked me if I would like to try a sheet at home. Well, yes of course! So, I came home with 2 meters by 1 meter large curtain, prepared as a cyanotype for me to expose. Yesterday I did. I had the figure in mind differently than it came out but well, a first timer anyway! Making of a Blueware Vase from Glithero on Vimeo.